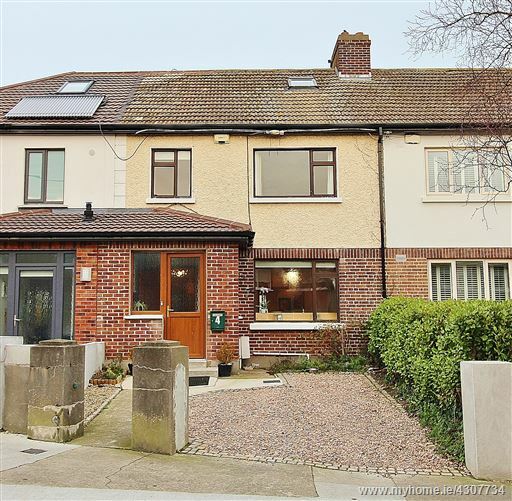 DNG are delighted to present to the market 4 Dollymount Park, Clontarf, a spacious 3 bedroom mid-terraced family home situated in the heart of Clontarf village within walking distance of all local amenities. Extending to a total floor area of approx. 1,399 sq. ft (incl. attic) this family home provides open plan living on ground floor level with a light filled kitchen/dining room flowing into the cosy lounge area which connects through double doors to the extended family/entertainment space. First floor level accommodates 2 large double bedrooms (master en suite), a single bedroom and a modern family bathroom. Off the landing area are stairs leading to a very large converted attic room with 2 x velux windows. To the rear of this impressive home is a private rear garden with lawned area and a selection of colourful flowers and shrubs. The front driveway is stoned providing off-street parking. Property in this condition and location are in extremely high demand and interested parties are advised to act quickly. This is one of North Dublin's most desirable locations and ideal for any family with its close proximity to a selection of well established schools. On the doorstep of Clontarf Village and a stones throw from the seafront promenade, a selection of boutique shops and The Bay Restaurant, this superb home will not disappoint. There are also excellent transport links with the Clontarf Road(QBC)and DART providing speedy access to the city centre. Simplay flooring, storage cupboards with gas burner. Solid Canadian oak flooring, tiled kitchen floor area, fully fitted solid oak kitchen with granite worktops, matching island, Belfast sink and tiled splashback, Rangemaster 110 cooker (optional extra), original thick coving. Solid Canadian oak flooring, feature fireplace with open hearth, original thick coving, feature block glass wall, double doors to extension.